Pierate - Pie Reviews: Wedding Bells on the Pierate Ship! Wedding Bells on the Pierate Ship! You might think it has been quiet recently on Pierate and it is true that we have made less posts than usual over the Summer. This is mainly because we have been busy with weddings. It has been 5 years since the last Pierate wedding but we have recently celebrated two more Pierate weddings. After all this wait they then occured on consecutive weekends at the end of June! First Pierateer TJP tied the knot in Cheshire. Next Pierateer SJL married Pierateer ALE in Gloucestershire. 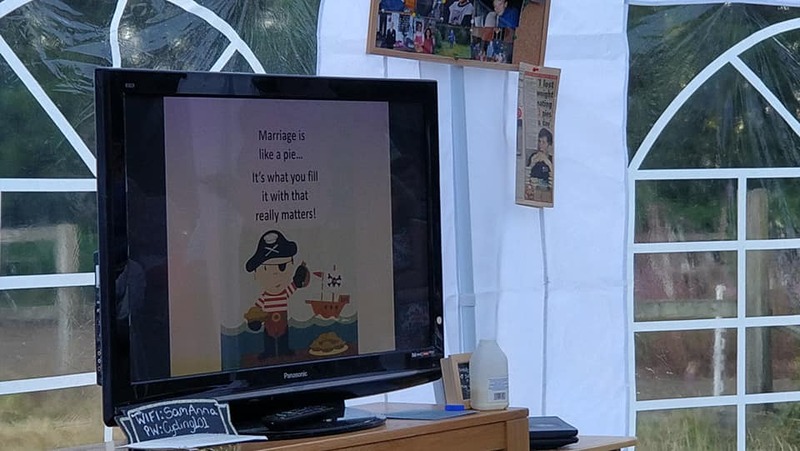 It was great to get all the members of the Pierate Ship together for both weddings with Pierateers RAS, ARL and The Ship's Cook also in attendance. Pierateer RAS has been busy as well because he was the best man for SJL and organised a great stag do which involved pies from our number one pie supplier, MyPie and inevitably saw Sam dressed up as a pie. Many thanks to Chris of MyPie and Pierateer Rob for arranging the delicious stag do pie lunch. 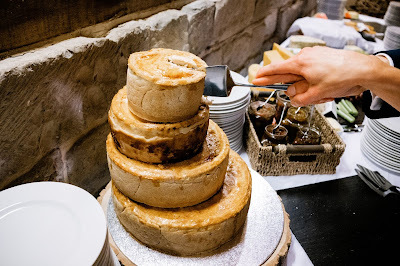 You might expect that for a Pierate wedding there also has to be a pie involved at the wedding itself! If you are an avid reader of Pierate you may know that Pierateer ALE is the Gluten Free reviewer for Pierate. 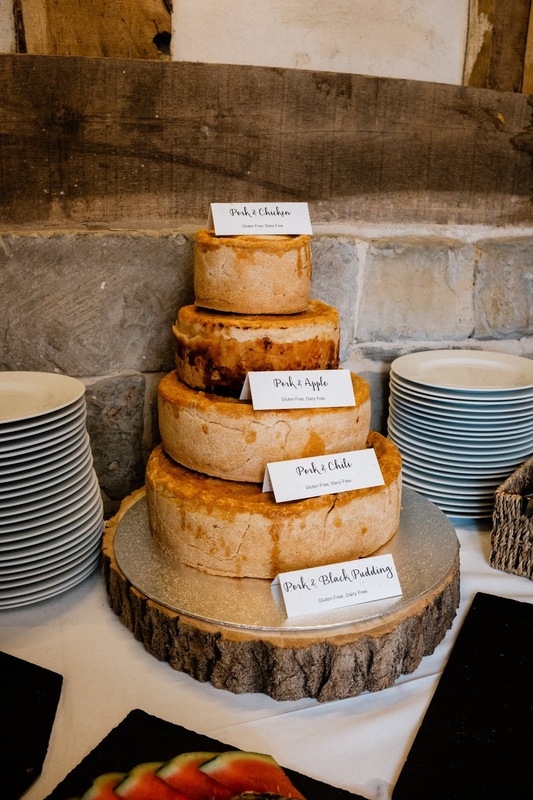 Fortunately this didn't prevent there being a top quality pie, with Voakes Free From providing a tiered wedding pie for the wedding of ALE and SJL! We have previously scored their pies very highly so we were delighted to be able to have them at the wedding. It was really quite spectacular, we are very grateful to them for arranging it and for sending samples to review beforehand, thanks so much to the team at Voakes Free From. 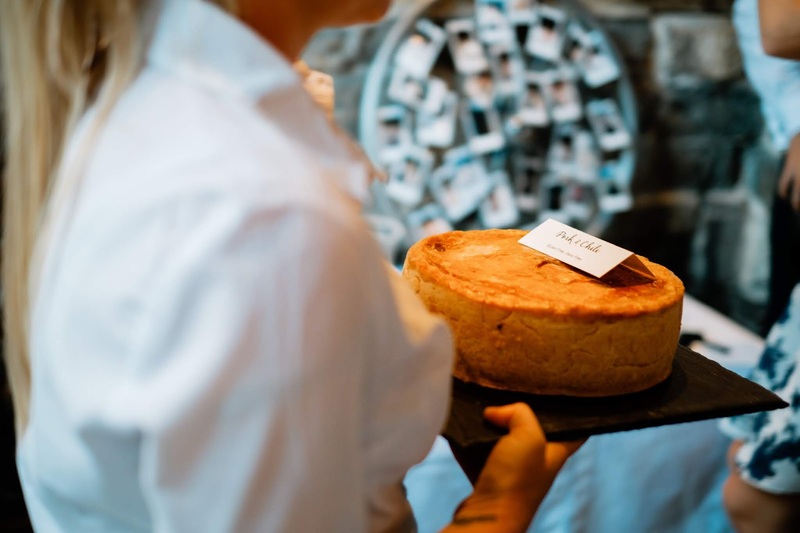 They even did a pastry lid to the pork and chicken pie on our request (it normally comes with a stuffing lid). The pies went down very well with the guests. There was very little pie left over at the end, the two smaller layers had completely disappeared before we even tried them! The pies arrived by courier the day before in excellent condition. We cannot recommend them enough. 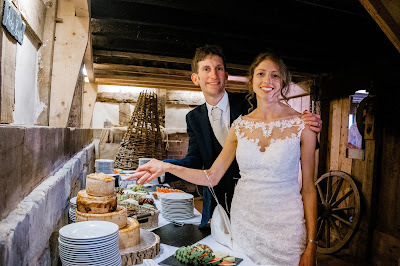 You can see from the photo how happy we were to be cutting our wedding pie! We didn't think it would be possible to have such a tasty free from pie that everyone could enjoy (it was dairy and gluten free with some smaller Voakes pies on the side for the vegetarians). We will finish this article with a quote from Sam's stag do "Marriage is like a pie, it is what you fill it with that really matters".